“Setters” – attr. Hubley (or Littco), Circa 1925. Plated iron. 5” high x 7-3/4” long. Weighs 7-1/2 lbs. the pair. 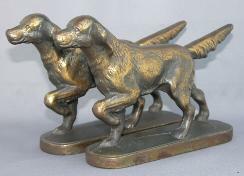 Seen in McBride’s Cast Metal Bookends, attributed to Hubley. Illegible round paper label on bottom. Great condition for their age.